At the east end of Embarcadero road turn right and then left just before the city dump. There is a small parking lot that is the start of several trails in Bixby Park. You can also do a loop trip by leaving a car here and taking another to the Miracle Mile walk. That walk and the bay option on this walk connect at the half way point. There are basically two walks starting from this point. the first, the bay option, walks straight out from the parking lot toward the bay. Walk over the dam and along the bay until it is time to turn around and head back to the parking lot. The second option takes a right turn just after the hill with the posts just before the lagoon. follow the lagoon to your right and the hill to your left until it is time to turn around. When you return, instead of retracing your steps, turn left and go up the hill. This will connect with the parking lot trail on the other side of the hill. 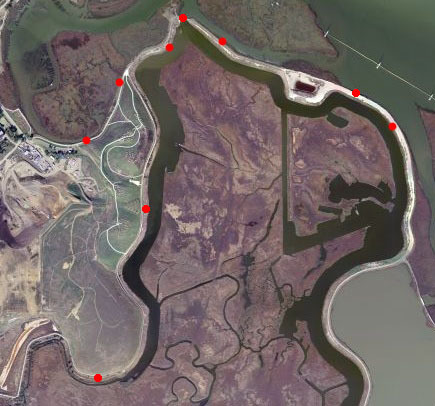 Throughout this area you can see Avocets, Ducks, Great Herons, Egrets, Harrier Hawks, Red Tail Hawks, Hummingbirds, Sparrows, Swallows, Kites, White Pelicans, and many other birds.